George Washington (1732-1799) was president of the US from 1789-1797. 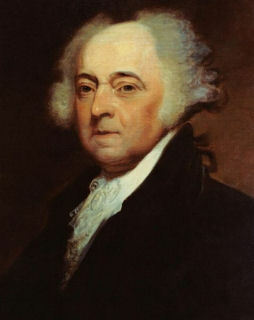 He was the first president and was elected unanimously after leading the American army during the American Revolution and taking part in writing the American Constitution. Washington was an effective President who was good at organising and who discussed problems with other people before making decisions. He is now remembered as 'Father of his Country' and, as he successfully fought for freedom from British rule, is often seen as a symbol of national freedom in other countries. 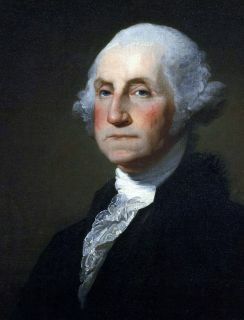 George Washington's birthday, 22nd February, is now commemorated in a national holiday in the United States, celebrated on the third Monday in the month as "Presidents Day". This useful George Washington booklet is simple to fold using these instructions. Choose from blank or lined and use it to keep interesting facts about this first President of the United States, quotes, etc. This colouring page of George Washington - taken from a book illustration, is aimed at older children. Here's a fun colouring page of George Washington, picking out some of his key characteristics for younger children! Because any decent portrait gallery should have a portrait of America's first President, here is one of our portrait gallery colouring pages of George Washington, complete with gilt frame. We have one for Abraham Lincoln too. Here is a portrait colouring page of George Washington looking very severe and grand, perfect for the kids to colour in on Presidents Day. Here's a simple cartoon poster of President George Washington for younger children. We've made the outline simple for cutting out and sticking, too. Here's a useful printable poster of a well known portrait of George Washington. Aimed at younger children, our George Washington writing page is useful for research or project work. Mount Rushmore in South Dakota features the heads of 4 US Presidents; George Washington, Thomas Jefferson, Theodore Roosevelt and Abraham Lincoln carved into the side. Colour our Mount Rushmore colouring page for President's Day or as part of a study on US History.